Indonesia is taking steps to regulate its air industry in the wake of revelations that the AirAsia flight that recently crashed took off without the correct permits. A number of officials have been suspended, while other airlines are being investigated. Indonesia is still reeling from the crash on December 28 of AirAsia Flight 8501, which killed all 162 passengers and crew on board. It emerged that the plane took off without being given the proper permits and this prompted the acting director general of air transportation to crackdown on those breaking the rules. Air chief Djoko Murjatmodjo says the airport’s operator and officials in the control tower have been suspended for their role in letting the plane take off from Surabaya airport. AirAsia planes were only permitted to fly from Indonesia’s second largest city to Singapore on Mondays, Tuesdays, Thursdays and Saturdays. The crash occurred on Sunday. AirAsia Indonesia is currently been investigated and while this is taking place, their route between Surabaya and Singapore has been suspended. Murjatmodjo also stated that it will now be the responsibility of airlines to provide pilots with up-to-date weather reports. Currently this is the responsibility of the captain and co-pilot, AP reports. Indonesia’s air industry has experienced massive growth over the last two decades, with AirAsia emerging as one of the region’s leaders in the low-cost travel market. The company did have a clean record until the crash of Flight QZ8501; however the same could not be said for flight safety in Indonesia as a whole. The country has experienced a number of accidents, with poor maintenance, poor implementation of safety guidelines and a lack of properly trained pilots often to blame. Search and rescue teams are still trying to find parts of the Airbus 320-200, which crashed into the Java Sea. 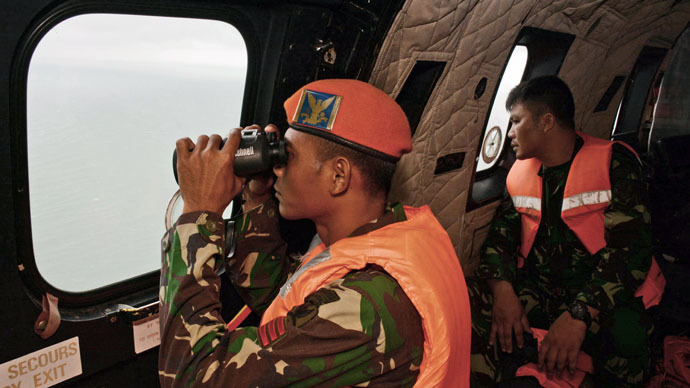 "I will facilitate the families of the victims who want to see the scene directly and how rescuers are battling high waves and bad weather to search for their loved ones and the plane," said General Moeldoko, Indonesia's top military commander. "We'll prepare two aircraft and a warship for them to go there and throw flowers," AP reports. It is still not known what caused the crash. Just before losing contact, the pilot told air traffic control that he was approaching threatening clouds, but was denied permission to climb to a higher altitude because of heavy air traffic. The search teams are still searching for the aircrafts black boxes, which could reveal why the plane crashed. On Monday, an Indonesian naval patrol found what could be part of the tail, where the black box voice and flight data recorders are located. "We found what has a high probability of being the tail of the plane," Yayan Sofyan, captain of the patrol vessel, told reporters, which was reported by Reuters. Peter Marosszeky, a senior aviation research fellow at the University of New South Wales in Sydney, remains confident that the search teams will eventually be able to pick up the “pings” that the black box records emit. "The seas haven't been very friendly, but the black boxes have a 30-day life and they will be able to find them, particularly in the shallow waters," he said. "It's the weather that is causing the delay." The search for the missing parts of the plane has been hampered by bad weather. So far five sections of the aircraft have been recovered. However, ships and aircraft scouring the Java Sea have widened their search as underwater currents could have moved some of the debris. Meanwhile, 43 bodies of the mostly Indonesian passengers and crew have so far been recovered, including some still strapped in their seats. Many more may be still trapped in the body of the aircraft.